When I made this summer salad, I found that the process of just combining amazing ingredients yielded a dish so quickly I decided to make two versions. 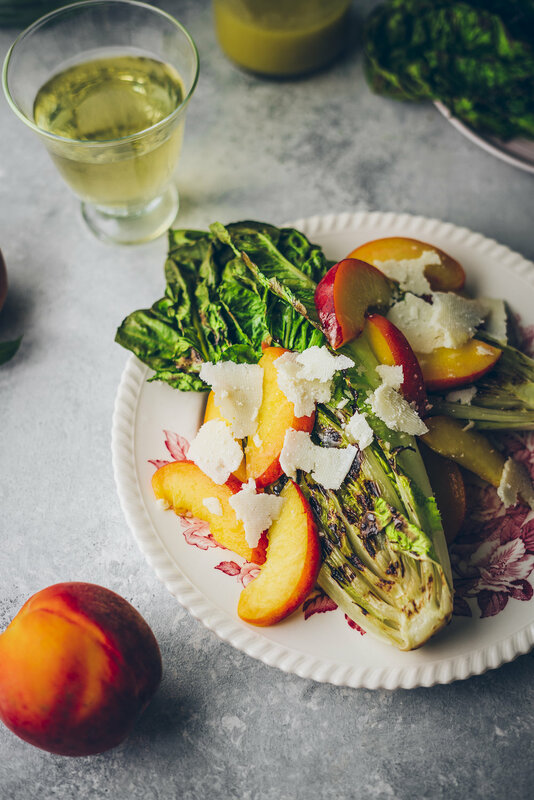 This version focuses on peaches and pecorino, while the other version (on La Crema’s blog) focuses on an avocado BLT approach. And these versions are made possible in large part by how fresh and bright and vibrant so much produce is this time of year. Peaches, tomatoes, romaine, citrus, avocados—hard to go wrong combining any of these in a salad. This salad is all about contrasts and complements. 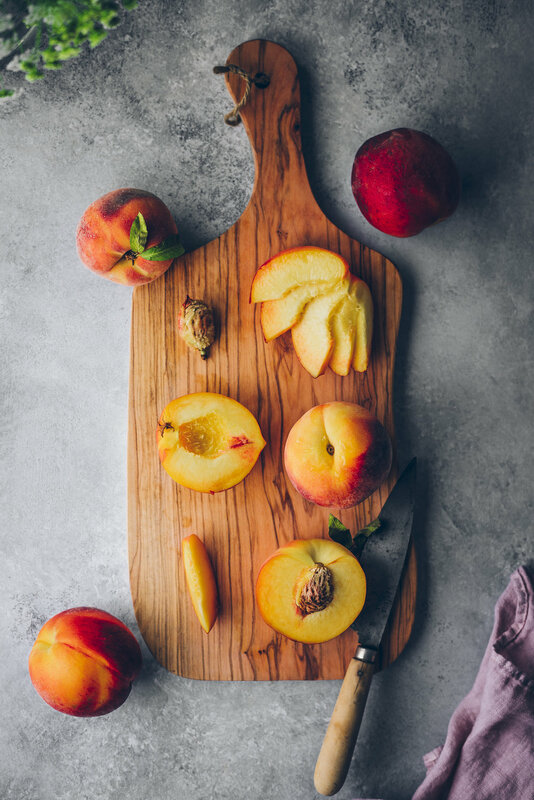 The peaches and pecorino, for example, come together in saccharine savory delight. The brisk cheese is striking while the buttery fruit is satisfying, but instead of cancelling each other out they coalesce into something special. The grilled romaine provides a charred savory base, while the honey-lemon dressing in which the salad is splashed provides a sweetened garnish. Each component plays off the other, and each bite is certainly the better for it. 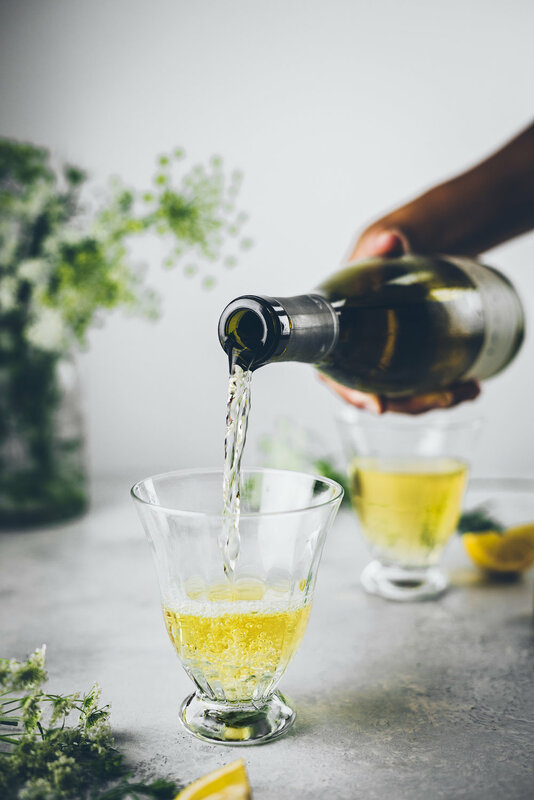 The final layer of contrasts and complements is completed by the wine, in this case La Crema’s Monterey Chardonnay. It’s peachy and pineappley on the one side, but acidic and minerally on the other. Tropical fruit and spices are held in skillful balance, just as bright citrus and the aroma of a seaside breeze strike a similar symmetry. An exciting wine for an exciting dish, no less full of surprises. I hope you enjoy this salad as much as I do, and please go to La Crema’s blog to check out my other version! Begin by making the dressing. Add the lemon juice, lemon zest, mustard, and honey to a small bowl and whisk until combined. While whisking, slowly pour in the olive oil. Continue whisking until the olive oil is well blended. Season dressing with salt to taste; set aside. For the salad, heat an outdoor grill to medium-high heat (a grill pan set over medium-high heat can also be used). Brush each of the cut sides of the romaine with olive oil, place on the grill, and cook for about 2-3 minutes, turning once, until slightly wilted and char marks appear. Divide each half of romaine between four plates. 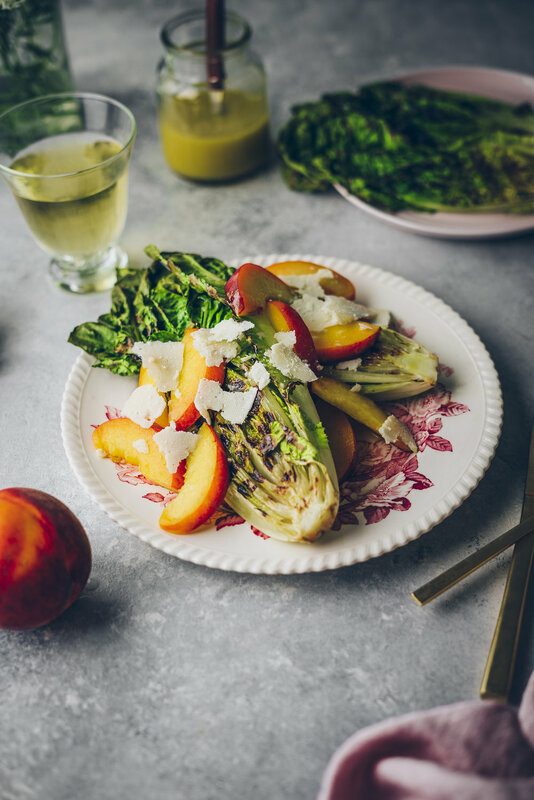 Garnish each plate with an equal serving of sliced peaches, pecorino, and desired amount of dressing. Enjoy salads right away!